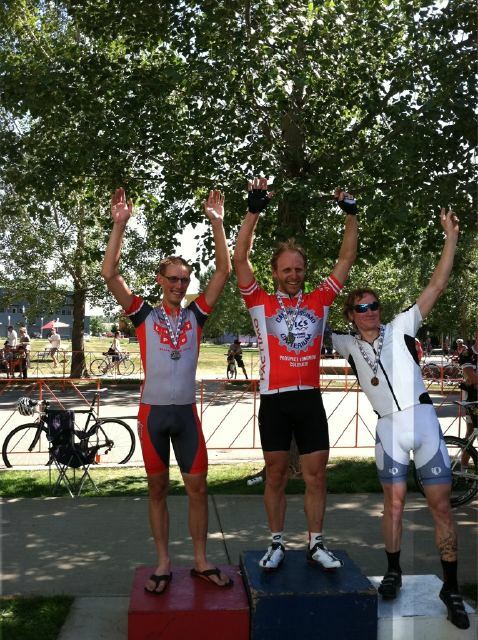 Today was the Vic’s Expresso Criterium in Prospect Park, which is located in Longmont. Coming in to this race I had a lot of confidence after coming in third at the State Criterium Championship as well as second at the Sanitas Sports Criterium. As usual, I showed up a few hours early to get registered and walk the course. I’ve found that walking the course (or riding it slowly) is a great way to get a feel for how things are going to play out. I’ll also generally watch a previous race from various places to know where the good lines are in the corners as well as where I can pedal and where I can’t. I did my standard 25 minute spin the on the trainer and rolled up to the start. The whistle blew and we were off. Being a tight, technical course, it’s generally best to stay in the first ten riders or so or else you risk not being able to move up. I found maintaining my position was fairly easy since BRC, as usual, were more than happy to keep the tempo fairly high. I tried my hand at getting into a few breaks without success and, after a few minutes of rest, I watched the winning break of three make it up the road. This is something I really need to work on, finding the winning break. Alas, I continued to go through the motions, expecting to be sprinting for fourth place, but with 20 minutes to go, all of the spectators were yelling for us to slow down. Apparently two of the riders in the break ran into each other and ended up laying on the road for a bit. This meant that we were now going to be sprinting for second. Much better! Two laps to go: I knew at this point the fight for position would be beyond critical and knew I needed to move up a bit further for the chaotic final lap. Out of the first turn I tried to move up the left side of the road, but got pinched by a few riders and ended up locking up my break, losing 10 spots. I’d worked too hard to give up at this point, so I did the only logical thing. Move up like a mad man on the slightly uphill section. Within the next lap, I was back in third position, directly behind Rashid (the current leader in the BAR competition and the winner of the State Criterium). I knew at this point I was set. This man was going to take me all the way to the finish line. We entered the second to last straightaway, the man at the front pulled hard. I think he was trying to get away, but I’m not sure. I was glued to Rashid’s wheel like glue until we rounded the last corner. Both of them took it wide, giving me the perfect path to slingshot around them. I gave it all that I had and came up first in the field sprint by several feet; placing second overall. It’s good to finally have the hard work payoff, but it stings knowing that I missed the decisive move. Only a few more points until my Category 2 upgrade and I’d really like to see the view from the top step of the podium before I get there!